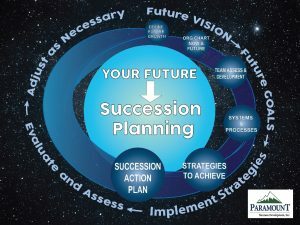 Whether you envision leaving your business to family members, selling it to fund your retirement, or to finance a new venture, you need to have a coherent succession plan in place. A solid succession plan will maximize the company’s value and ensure future growth. In spite of this, rarely is a company founded with any strategy to prepare it for that inevitable event. Over the years, simply growing and managing a business to maturity requires all the available time and energy, so most owners find themselves approaching retirement age without a clue as to how to make that necessary transition. Your business success was no accident. Your succession should not be either. Unless you intend to “die in the saddle”, and don’t much care what happens to the horse, you will want to responsibly pass the reins into reliable hands and receive the most value for your years of hard work. Failure to plan ahead jeopardizes the intrinsic value of the company and puts at risk all of your carefully trained and valuable team members. Paramount Business Development works closely with your company to assess the in-house talent and determine how they will meet future business needs after the owner/leader’s planned exit. If there are significant performance gaps, Paramount will either coach your Team Members to develop the talent needed in the future, or coach you to identify and hire outside talent to fill those gaps so you can execute a smooth transition. Paramount’s succession planning includes a number of essential inter-dependent processes: leadership development, business planning, effective delegation strategies, and team performance & communication strategies. Set Goals: If you don’t know where you are going you will never get there. Are you selling or passing on the family business? What is your timeline? Assess: What are your organization’s strengths? What about future needs and opportunities? How do you maximize your company’s value? Coaching/Training: Do you have the right internal talent to sustain and grow? Do you need to look outside for talent? Implement: Training, coaching, development, and decision systems have to be consistently implemented. Knowledge is useless without implementation. Evaluate: How do you know you are on track to achieving your goal? Check and double check. Paramount Business Development works closely with the Legal Advisors (Wills, Estate & Trust Planning) and the Financial Advisors (Tax and Inheritance Planning) to make sure there is a sound operation plan in place as part of the overall succession planning process. The legal and financial plans are 100% necessary, but do not guarantee the team is ready for the challenges of the future. The Coaches at Paramount are in the game with you, not just on the sidelines. To make sure your business team is ready for tomorrow, call Paramount Business Development today.